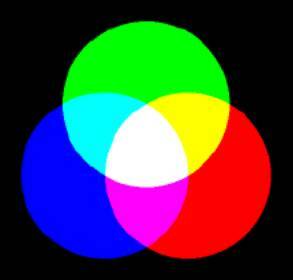 RGB merges colors from portions of colored light, so that 100% portions each of all RGB colors result in white. 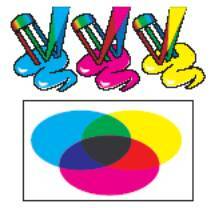 This process is also called Additive Color Blending. Color light is emitted, for example, by screens or monitors, so that RGB is particularly suitable for the representation of colors on a screen. 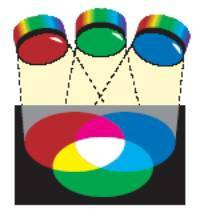 CMY merges colors from portions of dyes on printing paper, which absorb colored light, so that 100% portions each of all CMY colors result in black. Therefore, this process is also called the Subtractive Color Blending. 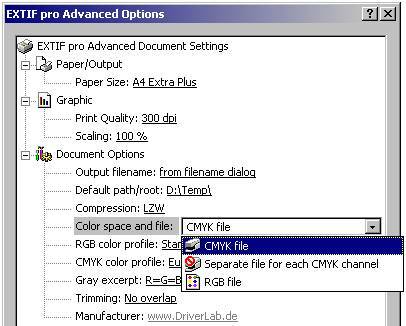 If you view a CMYK file, no matter whether or not it was created by EXTIF, with an image viewer program and you discover "wrong" colors like in the above illustration, then remember: it does not necessarily mean that the colors are wrong, not even that the image viewer has made a mistake somewhere along the way, but screens are simply not suitable for correctly displaying CMYK colors - "truth lies on the paper" and not on the screen, at least concerning CMYK colors. 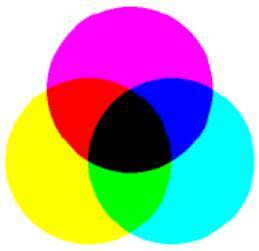 Regarding the fourth color, “K” (blacK): Theoretically, it is considered that Cyan, Magenta and Yellow blend into 100% perfect black. In practice, however, the existing color dyes unfortunately mix into a dirty dark gray-brown only. In addition, color dyes cost quite a sum of money, so that one prefers to achieve the desired black by using one cheap dye, instead of blending three expensive dyes into an undesired color.